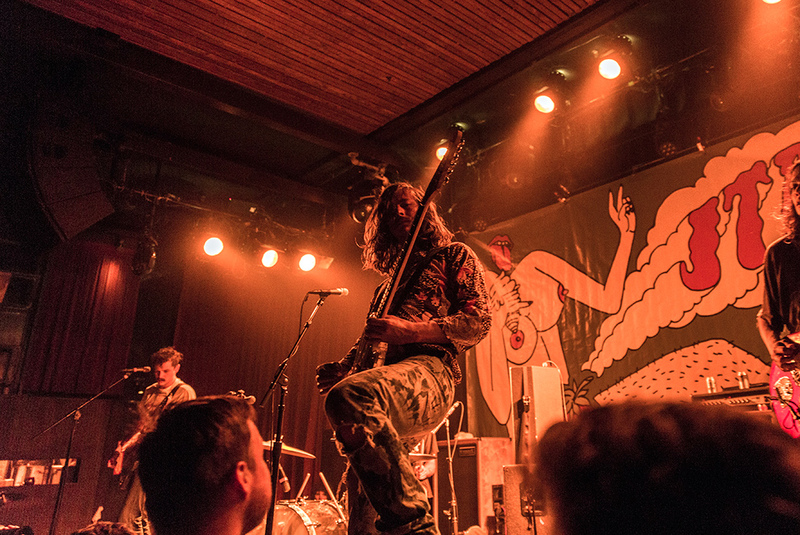 Nashville’s JEFF the Brotherhood were in SF a few days after the release of their newest record, Wasted on the Dream. The newly independent-again band, having been dropped/released from Warner Bros. Records, put the record out on their own Infinity Cat label (also home to fellow Nashvillains and TMB faves Diarrhea Planet). The show at the Independent was a typically raucous JEFF the Brotherhood show, but JEFF the Brotherhood itself is a little atypical these days, as the band has grown from the duo of brothers Jake and Jamin Orall with the addition of a bassist and second guitar player. This new incarnation of the band sounds more filled-out, and maybe more importantly, singer/guitarist Jake Orall now has someone to lean against for back-to-back guitar shredding. Fellow Nashvillains, the four-piece grunge/punk band Bully are touring with JEFF The Brotherhood, and there were definitely those in the crowd that came specifically to see them. San Francisco punk band Scraper opened the show with a pretty tight set of their own.